There are two levels of access to Total Gym TV: Basic and Premium. Total Gym TV Basic is completely free, and gives you access to 16 of our classic DVD workouts and instructional videos. We're offering this free option as a thank-you to all of our loyal Total Gym TV customers over the years. 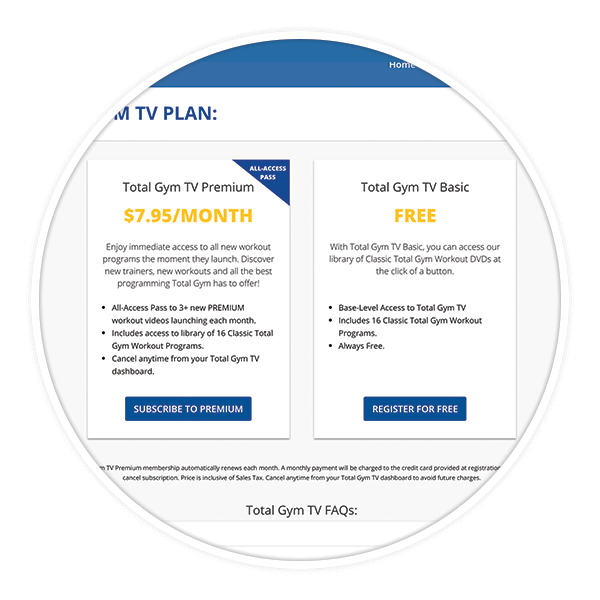 Total Gym TV Premium is our monthly paid subscription service. Every month, we release new Total Gym workouts available exclusively to Total Gym Premium members, in addition to the benefits of Total Gym TV Basic! YES! Upgrade to Premium at any time by clicking the link above or adding the Premium subscription in your account dashboard. Signing in to Total Gym TV is easy! On a computer, go to the top right of your screen, and click the yellow "Sign In" button. On a mobile device, go to the top left of your screen, open the menu, and select the "Sign In" menu item. Once on the "Sign In" page, enter your email and password details. If you have forgotten your password, open the "Forgot Password" link under the "Sign In" form, and complete the process to retrieve or reset your password. 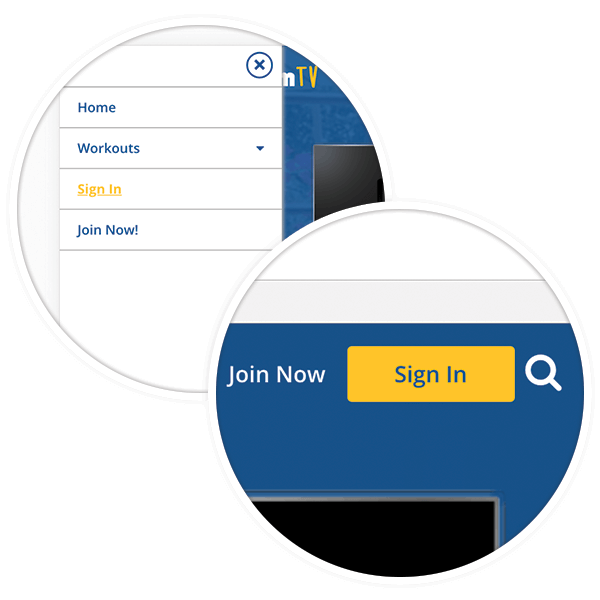 Once logged in, you can easily select and browse a workout from your library. To open your workout library, open the "My Account" menu located in the main menu area, and select "My Library". If you are a Total Gym TV Premium subscriber, new workouts are added your library each month. At the current time, Total Gym TV is only accessible from a web browser. As the platform continues to grow, we will be releasing iOS, Android, Apple TV and other apps to help you workout whenever, wherever. Make sure your safety pins are in place. Make sure any attachments are securely fastened or out of the way if you aren't using them.